This talk is a collaboration with Ineke Hans’ London Salon series, investigating new perspectives on design. Community Economics brings together social entrepreneurs from Newfoundland, Bosnia and The Netherlands to share their experiences in using the design process to bring about economic and social change. With panellists Zita Cobb, Orhan Niksic, and Petra Janssen (Social label), moderated by Daniel Charny. Entry is free, but spaces are limited and on a first come first serve basis. RSVP here. Want to know more about Social label? 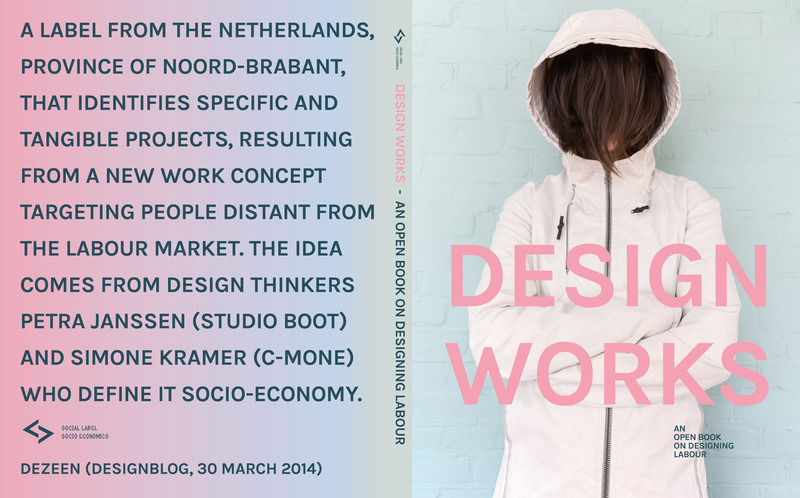 Buy our book ‘Design Works!’ by going to our webshop. Together with all the insights gained from the debates, experiences and practices the publications offers an overview of Social label from the birth 2011 until now. All tackled from different perspectives and highlight a range of sheltered workshops and social businesses, exploring what design can do for society in terms of social inclusion. From lessons learned in the process, to ‘a manifesto’ for a new economy based on human values: Social label – Socio economics celebrates the power of design and communication, and is a striking attempt to make a change in the Dutch system of labour, participation, and social return. In collaboration with leading designers and sheltered workshops all across the Netherlands – from care organisations to businesses – we are creating a design collection that builds a sense of self-worth and opens new perspectives. We are a platform for designing labour to create new opportunities and demonstrate what meaningful design can do to create an inclusive society with enjoyable work for all.